Wash Wizard is like a professional car wash! The Wash Wizard has hundreds of soft-touch, microfiber cleaning pads that spin inside the powerwash head, gently cleaning and polishing without scratching! With the extension handle you can wash the entire windshield and even reach on top of the hood. It is a car wash right in your own back yard or driveway! 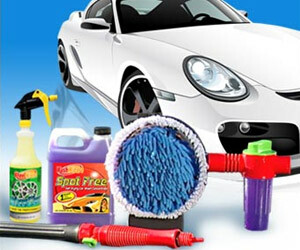 The Wash Wizard is the professional power wash wand that makes cleaning your car fast, easy and affordable.